Hassan, located in Karnataka, has a special place in history. It was the command centre of the Hoysala Empire, one of the most successful dynasties of South India. The district was named after the presiding goddess of the region called ‘Haasanamba,’ and has a population of about 1.77 million as per the 2011 national census. Having been the focus of many empires over the centuries, there are many places nearby Hassan that is worth visiting if you are interested in exploring the architectural heritage of Karnataka. Shravanabelagola: The place is famous for the 27-metre high statue of Lord Bahubali, a Jain religious figure. It is the tallest monolithic statue in the world and was built about a millennia ago. A special ceremony is conducted once every 12 years in Shravanabelagola. And if you are on location during the ceremony, then you must try to attend. Shravanabelagola is located 51 kilometres from Hassan. Belur: Located on the banks of the Yagachi River, Belur is known for its exquisite temples. The most famous amongst them is the Shennakeshava Temple. The construction of the temple was completed over a period of more than 100 years. One look at the temple and you will marvel at the intricate stone works. You could also ponder on the dedication of artisans in those times to have completed this architectural wonder. Gorur: Gorur is a place nearby Hassan (about 20 kilometres away) where you will find one of the biggest reservoirs in the state, which was created by damming the River Hemavati. At a height of 146 feet, the reservoir is truly spectacular to look at and is best visited during the Monsoons. The dam is about 4,300 metres long. Manjarabad Fort: Built by Tippu Sultan in 1792, the Manjarabad Fort is a star shaped structure and has a height exceeding 3,200 feet. Mainly used to confront enemies, the fort got its name from the local Kannada word for fog (Manju). Look for the secret tunnel underneath which was used by the royal family to escape in times of attack. Shettyhalli: Just about 13 kilometres from Hassan is a place called Shettyhalli which is home to the famous Drowning Church. Built in 1860, the church is currently in ruins. What people find interesting about the church is that it remains completely submerged in water when the rainy season is in full swing, and only appears when the waters have receded. Halebid: Another must visit place for those looking to explore the cultural history of the state and located nearby Hassan is Halebid. The place is mostly known for the Hoysaleshwara Temple. Its popularity comes from the highly detailed carvings of humans, animals, and Gods that adorn its walls and attracts thousands of tourists. Even though 86 years were spent constructing the temple, it was, unfortunately, never completed. 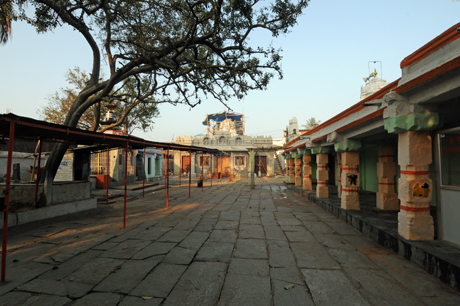 Koravangala: What makes many people attracted to Koravangala is the three 12th century Shiva temples created in the Hoysala architectural style. A shrine dedicated to the Sun God Surya also exists, which features 6 feet tall idol of the deity. The walls of the temples are ornamented in an intricate manner, and will definitely evoke the interest of any person who loves art and architecture. So, what are you waiting for? Plan a trip and add the places nearby Hassan to your itinerary? Have a Happy journey.